Even the sturdiest and most beloved patio set eventually starts to show some wear. The fabric may have ripped or faded, or too many summers worth of stains may have left them looking particularly grubby. (Pro tip: If your fabric isn’t that far gone yet, you should check out our tutorial on cleaning and stain removal for outdoor fabric. You might be able to save it!) There are many reasons to reupholster outdoor chairs, but what about sling chairs? In case you were wondering, it is absolutely possible to handle patio chair sling replacement as a DIY project. Sling chair construction might look tricky, but don’t be fooled. 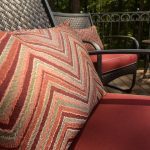 With beautiful designer fabric from Phifer and our comprehensive tutorial, you can learn how to replace sling chair fabric in an afternoon. Before you know it, you’ll have a fabulous new set of patio chairs just begging you to throw a BBQ. You’ll also have bragging rights that will see you right through the summer. Reasons to Replace Sling Fabric vs. 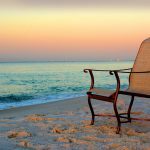 Faded, stained or torn fabric doesn’t always mean you need to start shopping for a whole new patio set. 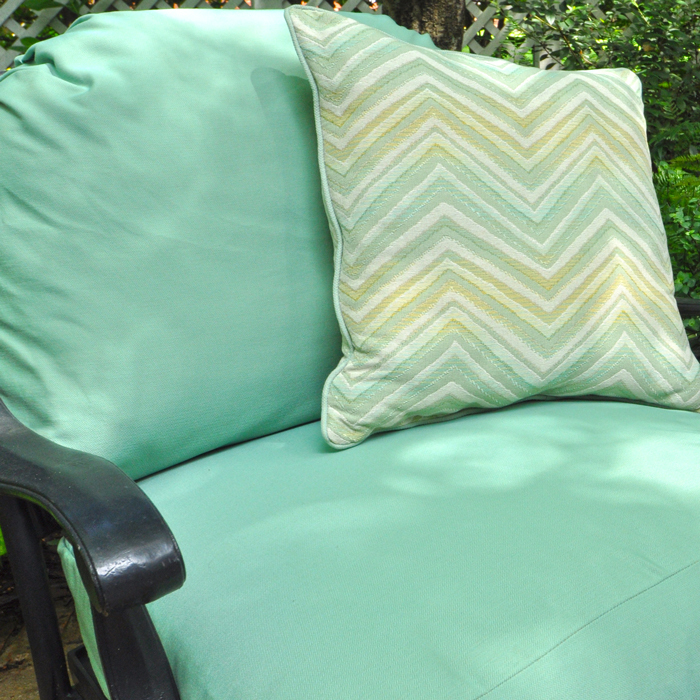 Outdoor chair fabric replacement is far less expensive than replacing an entire set. It also gives you an opportunity to express your creativity and individual style. 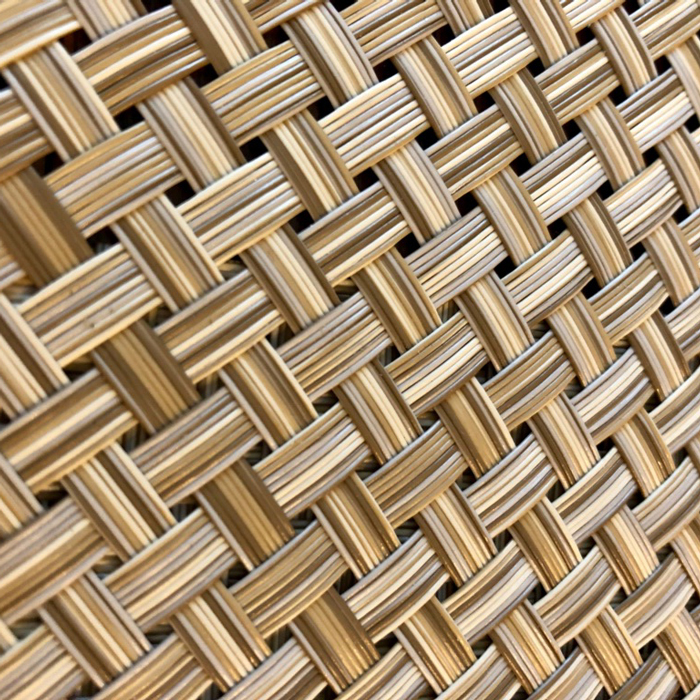 With Phifer’s incredible range of sling chair materials in a variety of colors, textures and weaves, you can design the outdoor space of your dreams. Measuring the dimensions of your current sling chair (see detailed instructions below) will give you an idea of how much fabric you will need. We have put together a handy guide to fabric amounts for common sling chair dimensions here. Most standard sling chairs are 24” (61 cm) wide. Phifer’s sling chair fabrics come in 54” (137.2 cm) widths, which is wide enough to comfortably cover two sling chairs. Please consult your own measurements to be sure but, if this is the case for your chairs, you can roughly calculate how much fabric you need in yards by measuring the width of your chair and multiplying by the number of chairs you are planning to recover. These chair fabrics are made with very little seam allowance so you won’t need much extra, but it’s always good to give yourself a little wiggle room. To find out how much binding you will need for this project, measure all four sides of your sling chair and add the numbers together, then add about 2” (5.1 cm) to allow for overlap. Finally, multiply by the number of chairs you’ll be recovering. Again, it’s a good idea to add an extra ½” to 1” (1.3 to 2.5 cm) to this number to make sure you don’t run out of fabric. Use a flexible cloth measuring tape, the type used in dressmaking, so that it will mold to any curves your chair might have. Keep paper and pen handy to write down your measurements as you go. With your chair standing upright, take the following measurements. ​Measure the width of the top edge of the chair seat from side to side. ​Measure the width of the bottom edge of the chair seat from side to side. Measure the length of the chair from the top edge of the chair back all the way down to the bottom edge of the seat. Turn your chair upside down. You’ll need to measure the distance between the screw holes that hold the chair frame together. Chair types vary, but the basic method is the same. Run the measuring tape down the side edge of the chair and write down the distance between the top edge of the chair back to the first screw, from the top edge of the chair to the second screw, and so on until you reach the last screw. Step 2: Take apart your chair frame. Again, hardware will vary between chair styles, but the basic idea is the same. Using a screwdriver or socket wrench, start to disassemble your chair, one screw at a time. Keep a jar or bowl near your workspace to place any screws, nuts and bolts. This will keep each one accounted for when it’s time to put your chair back together. You may also want to label the bars with a Sharpie as you remove them. Use a numbered system or just write “top,” “middle,” bottom,” etc. If you make your marks on the inside of each bar’s screw plate, where it attaches to the chair, they won’t be visible when you reassemble the chair frame. Take pictures as you go for reference. It will help you remember where each piece fits when it’s time to reassemble. Once all the screws have been removed, you can remove the two inner rails that are used to tension the fabric. At this point, you should be able to reach inside the “pocket” of the existing fabric sling to remove any inner hardware. The sling should now come off. Step 4: Pattern your sling chair. Creating a pattern for this DIY project is simple. For the envelope style of sling chair, you will need to cut two rectangles, one for the front and one for the back of the envelope, using your measurements. Using a fabric marker (such as tailor’s chalk or even a Sharpie in a contrasting color), you can make marks directly on the fabric to indicate where you plan to cut. A yardstick or T-square will allow you to trace straight lines on the fabric in the dimensions you need. Top of envelope: Be sure to indicate which end of the rectangle is the top with a T or an X. Hardware marks: Make marks indicating where the screws will go once you are reassembling the chair, referring to your earlier measurements. Take another look at the old sling, examining the slits in the fabric where the hardware once fit. Mark the length of the fabric slits onto your new fabric, as well as the juncture where the screw or bolt actually went through the fabric. These marks will be your guide once you begin stretching the sling over the chair. Envelope opening at bottom: Using the old sling as a guide, mark the width of the opening. Make the marks about an inch long towards the center of the fabric. Step 5: Cut out your fabric. Following the lines you’ve made, cut out your rectangles using sturdy fabric scissors. You will also need to make cuts along the marks you made for the hardware slits and for the envelope opening. Step 6: Construction / sewing. First, take the flap of fabric at the bottom of your bottom sling and fold it inwards towards the center of the fabric. Using your thumbnail, press the edge down. Using a ¼” (.6 cm) seam allowance, sew this flap down to create a nice finished edge for the envelope opening. Next, it’s time to sew the side seams. Use basting tape to mark along the top and side edges of the fabric rectangle which will be the top of your chair sling, staying as close to the edge as possible. On the bottom of the chair sling, use the basting tape to mark the bottom edges outside the envelope opening. Avoid crossing over the cut-out. Line up the bottom panel on the top, right sides together (that is, keeping the side with the folded envelope opening outwards) and making sure all edges meet. Remove the paper from the tape to reveal the glue a few inches at a time. Gently press with your fingers to stick both sides together. This might require a little patience to get everything straight. Don’t worry if it’s not 100% perfect. You can trim any slight unevenness after basting or sewing. Starting at one side of the envelope opening, sew along the basted edges of your sling with a straight stitch, staying as close to the edge as possible with almost no seam allowance. This will keep your sling the right size, and will also mean you can fully cover the seam with your binding. As you reach each corner, make sure your sewing machine needle is buried in the fabric. Raise the foot, pivot your chair sling so that you’re in position for the next seam, and then lower the foot. This will allow you to sew in one continuous line all the way around the sling, stopping at the other side of the envelope opening. A binding gives your chair sling a neat and polished edge. (It also hides any traces of the basting tape!) To add your binding, start in the middle of one of the long edges of your chair sling. Fold the binding over the edge and sew with a straight stitch fairly close to the edge of the binding. You can fold as you go, working 6” to 18” (15.2 to 45.7 cm) away from the needle as you sew to make sure the binding is folding smoothly and hugging the edge of the fabric. When you come to a corner, you’ll need to make a fold in the binding to make a 90-degree turn. Use the same foot-lifting maneuver to turn the corner. Go slowly to ensure that the fold is neatly sewn down. Continue to sew the binding on around the perimeter of the chair sling. You’ll notice that adding the binding closes the outside edge of the hardware slits you made earlier, so that they will function like buttonholes. Sew right across the raw edge of the envelope slit at the bottom and continue until about 6” (15.2 cm) before you meet the beginning of the binding. Fold the raw edge of the binding inwards to create a neat end. Keep sewing, overlapping the beginning of the binding by about 2” (5.1 cm). Reverse your machine and backstitch a few times over this joint to make it nice and secure. Step 8: Reassemble your chair. Start with the side rails, inserting them into the envelope and guiding the screws or bolts through the slits in the fabric. This is where you may need to stretch your sling slightly, adding some tension to the fabric. A very snug fit is what you want. Next, re-attach the remaining bars and hardware, referring to your photos and markings to ensure that everything ends up back where it began. Be sure to tighten any screws and bolts completely to make sure the chair is sturdy and safe! You’re done! Time to take a break and test out your comfortable, gorgeous new chair... maybe with an icy beverage in hand. Sling chairs put fabric under quite a bit of tension, which means that any fabric you use must be up to the job. 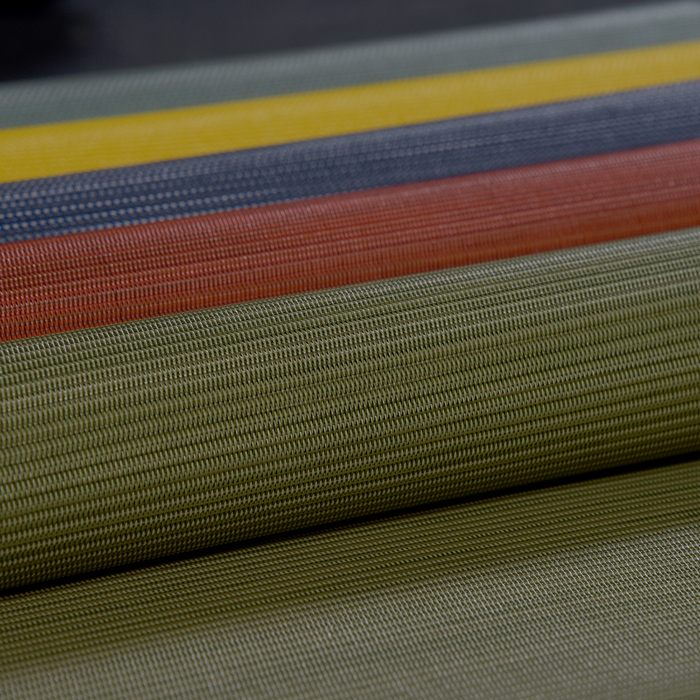 Phifertex​ slingable fabrics are beautiful, rugged and specially engineered with the dimensional stability and strength required for sling furniture applications. Phifertex​ fabrics are stain- and fade-resistant and easy to clean. 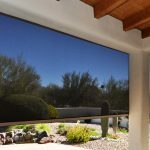 Our Phifertex​ line is also infused with Microban® protection, which makes them antimicrobial as well as resistant to mold and mildew, allowing your furniture to stand up to the demands of outdoor life and give you many years of quality use. Phifertex​ is also GREENGUARD® Certified, produced in accordance with some of the world’s most rigorous emissions standards. Explore our Phifertex​ fabrics to find the one that will help make your patio furniture a delight to enjoy for years to come. Made from 100% PVC, Jacquard fabrics offer some of our most intricate design work. You’ll find tapestries, florals and geometrics to suit the most sophisticated tastes. 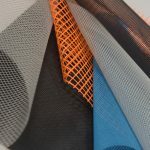 Perfect for the most demanding projects, these rugged, slingable fabrics have been designed and engineered for a wide variety of applications that demand extra strength and/or dimensional stability. Don’t let their tough pedigree fool you, though: available in a wonderful range of solids and stripes, they are every bit as attractive as they are hard-wearing. If you’re seeking an indoor-outdoor solution, these fabrics combine the dimensional strength of vinyl-coated polyester yarns with the touchable softness of olefin yarns. 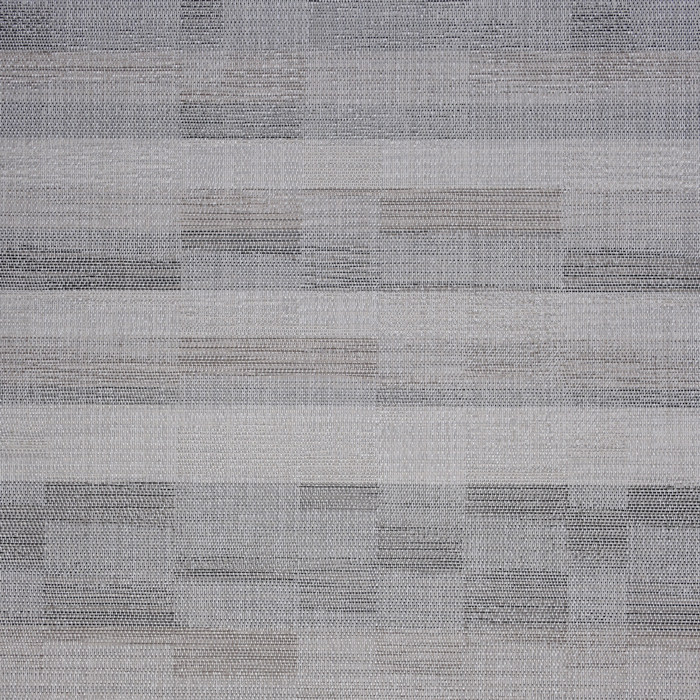 Available in spectacular weaves, tapestries, solids and stripes, and appropriate for both sling and cushion furniture applications. The dobby weaves of wicker Phifertex® fabrics mimic the textures of nature – wood, rattan, and wicker – but retain the strength and stability for sling furniture. If you want a natural look for your outdoor furniture in a low-maintenance, long-lasting fabric, you’ll find your perfect material here. Now that you’ve conquered sling chair replacement, maybe it’s time to expand your DIY horizons! 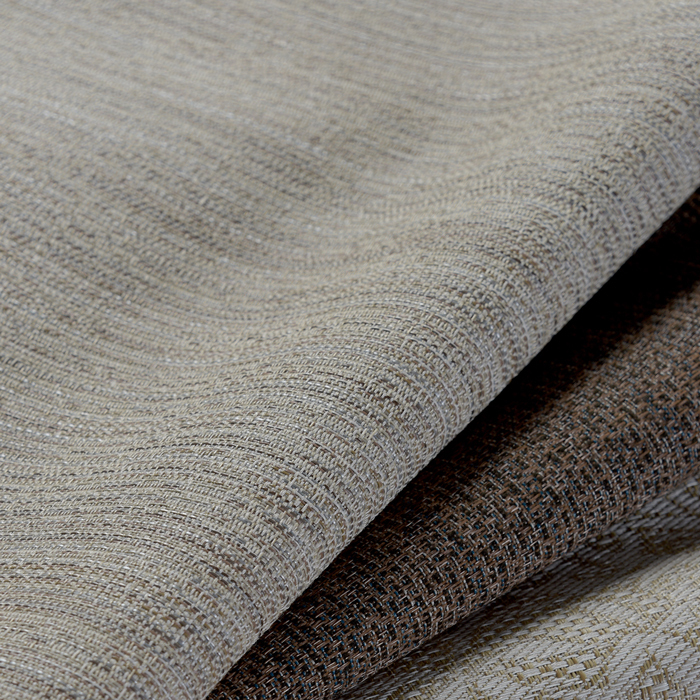 Phifer offers designer outdoor fabrics beyond our sublime slingable fabrics. Even better, all Phifer Designed Fabrics come with a 3-year warranty. For fabrics with softness and beauty to rival indoor textiles but enough rugged strength to withstand the outdoors, check out Phifer’s amazing cushion and pillow fabrics. Looking for another easy DIY sewing project? 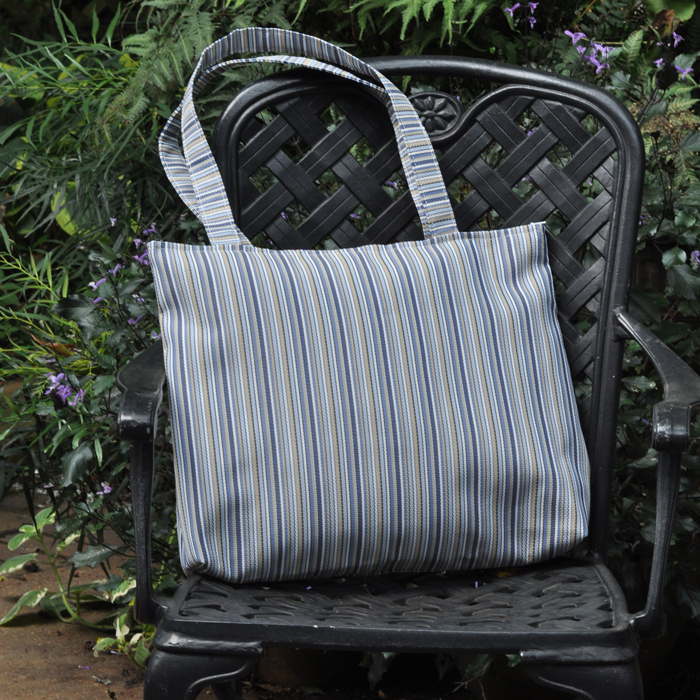 Phifer Designed Fabric is a great choice to make colorful tote bags for everyday use or a trip to the beach. 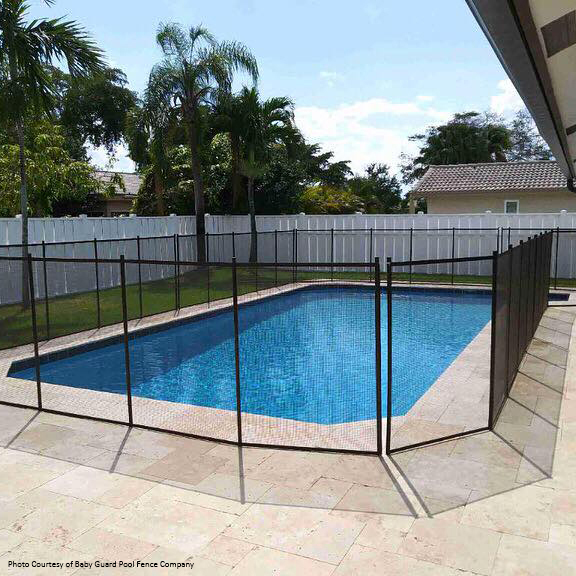 If you have a pool in your backyard, Phifertex​ can be used to create attractive, durable pool fencing that keeps kids and babies safe by creating a barrier between them and the water’s edge. 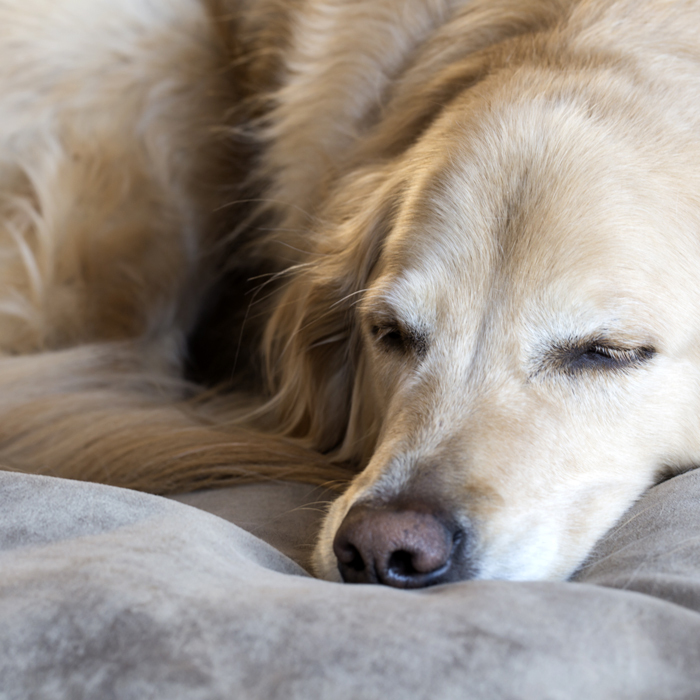 Make Fido feel like he’s part of the family with a pet bed you’ll be proud to have in your home! Durable Phifertex​ and GeoBella​ designer fabrics can help you whip up a pet bed that can stand up to even the most intense sessions of puppy playtime! In need of fencing for a Little League game or your company softball outing? 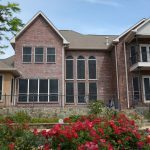 Working on a home improvement project and want to protect it from foot traffic? Or need a little extra privacy? 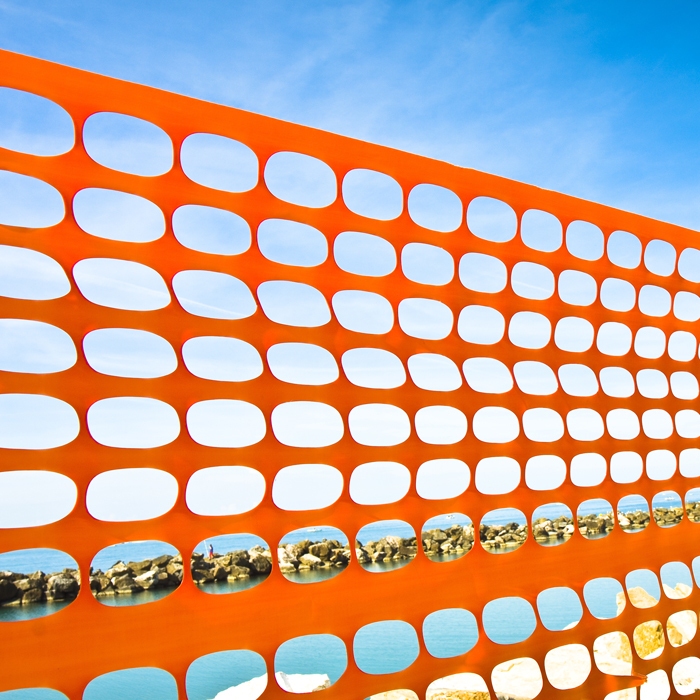 Tough Phifertex​ fabric is a utility player when it comes to temporary fencing. Stumped as to which one to use? Use our visualizer to find out which of our Designed Fabrics is right for your next DIY project. Need some more guidance before you dive into your DIY project? Get in touch with us! Phifer is here to help with friendly fabric experts who are always happy to answer questions, over the phone or via email or live chat! If you need help sourcing the Phifer Designed Fabrics you’ve fallen in love with, we can even help you find a local or online retailer who stocks them!